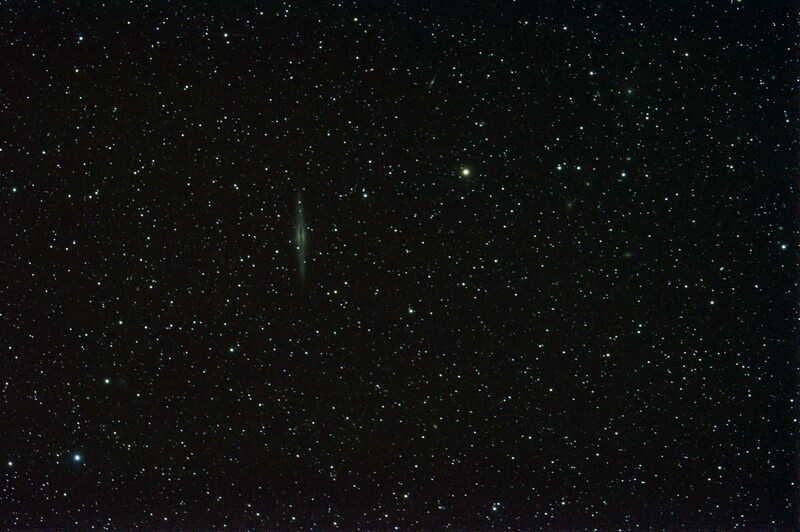 Inspired by several astrophotographers around the world posting images of the amazing tail developing on PANSTARRS, I decided to have another go at this comet. There is a minor road / very long layby running parallel to the A591 on the hill between Kendal and Staveley, with unimpeded views to the north. I reckoned it would be almost as good as driving into the Kentmere valley. En route, I dropped by Helsington Church again, to see how the planetary alignment was changing over the Langdales. 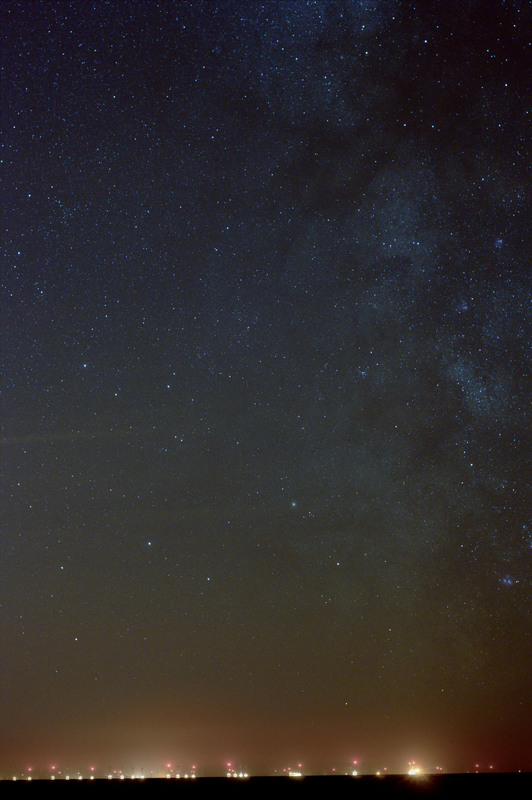 Jupiter, Venus and Mercury were now in a straight line and all clearly visible. I met a delightful family who had come to look at the sunset after spending the day in Kendal, and we passed such an enjoyable half hour with my binoculars spotting planets that I forgot to take photos. 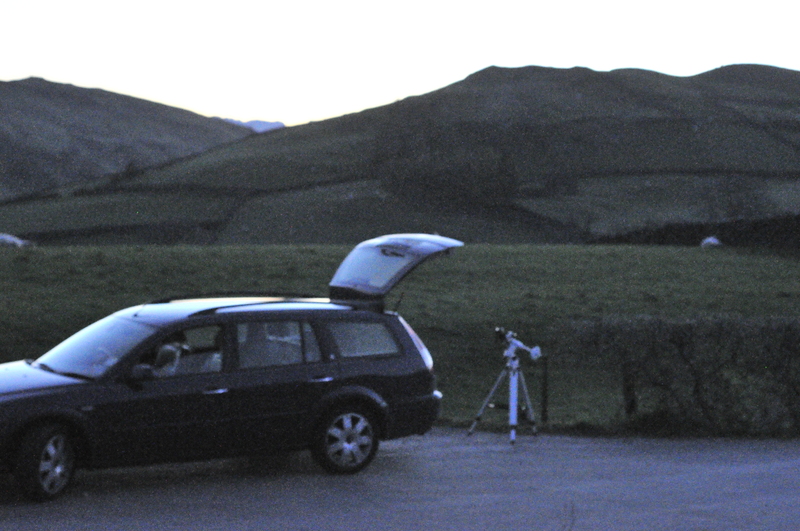 On to the layby, and quite easy to set up with Polaris visible in almost enough twilight to see the mount dials. Hold on though, that northern sky is getting brighter, not darker! 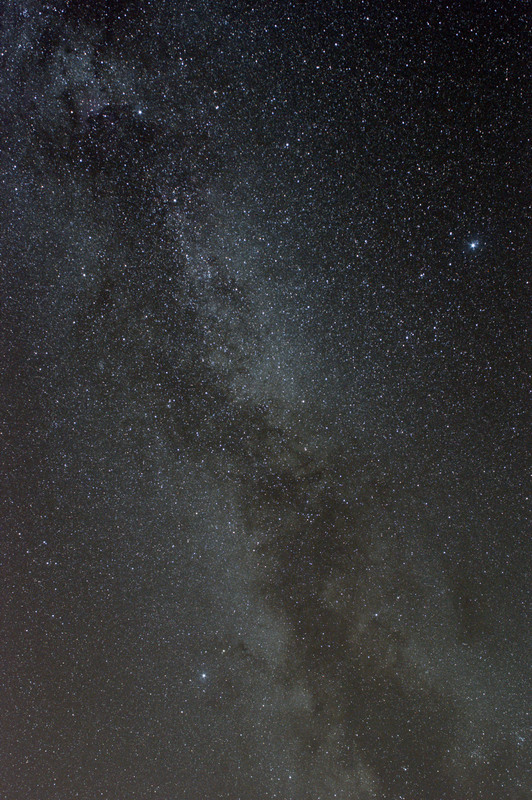 18mm f/3.5, ISO 1600 1 sec. Yes the noctilucent cloud season is under way. I can’t make up my mind about these clouds that are only visible at night – is this astronomy or meteorology? 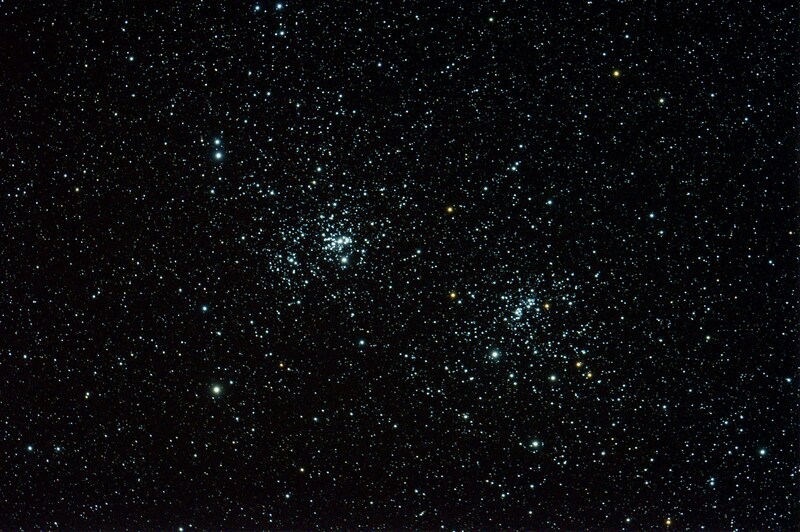 Yes, they are really pretty to look at, with amazing variation and complexity in their structure, but that’s Cassiopeia up there, and my dark sky location is ruined. Two High Pass filters: 40 pixels and 4 pixels. Sharpened in Photoshop, the structure resembles waves on a beach. 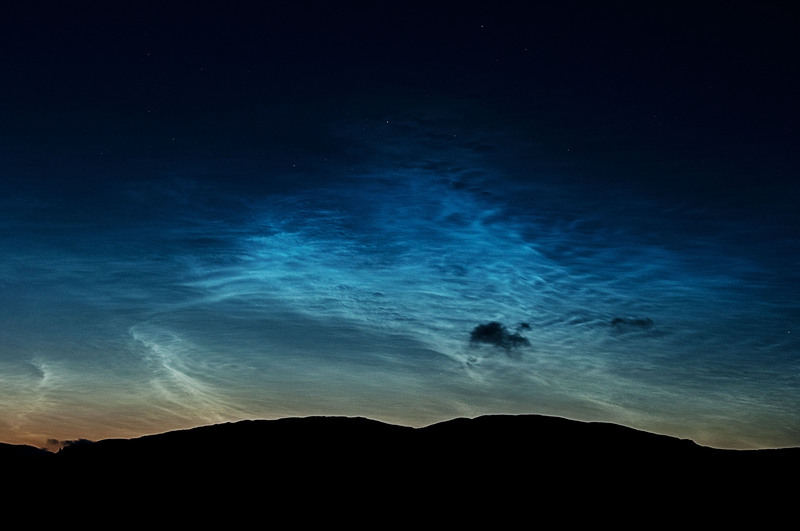 Prompted by a comment on Noctilucent Clouds 2013, I have experimented with sharpening these images using two Photoshop techniques: Unsharp Mask and High Pass Filter. 50mm f/8, ISO 1600, 3 sec. Unsharp mask 200%, 4 pixels. Unsharp mask – Photoshop’s main choice of sharpening tool, but the effect can be seen across the whole image. High pass filter 1: 40 pixels, soft light blend. High pass filter 2: 4 pixels, hard light blend. High pass filter – this sharpens only regions of higher contrast ie edges, that benefit from sharpening but leaves the rest of the image untouched. 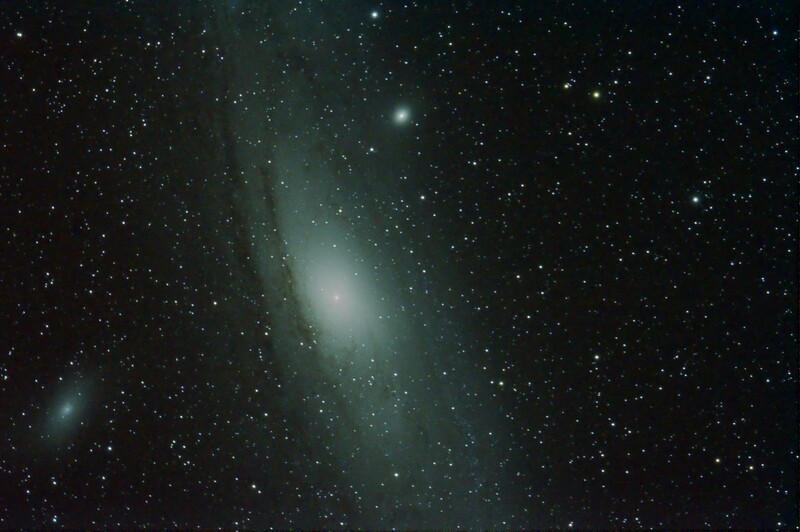 I picked up this tip from Nik Szymanek in a workshop at the International Astronomy Show in Leamington. 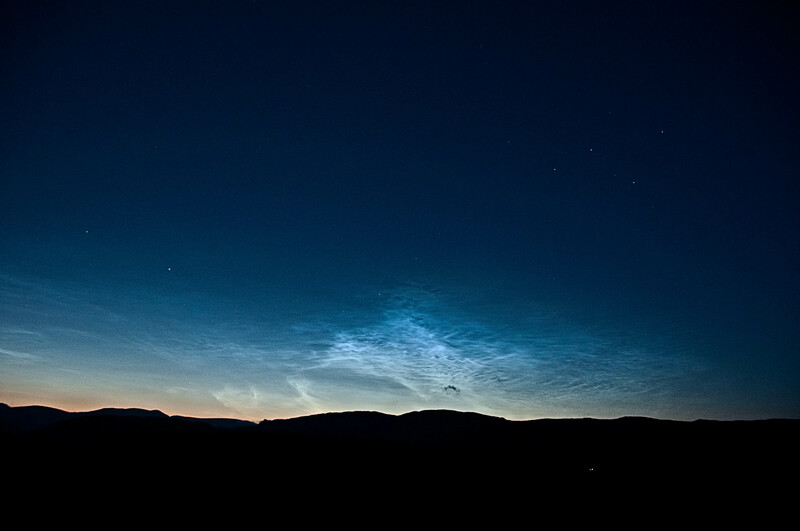 Nik was using it to enhance detail in galaxy images, but the principle applies just as well to noctilucent clouds. I prefer this sharpening effect which doesn’t introduce the “sharpened feel” artefact to the whole canvas. 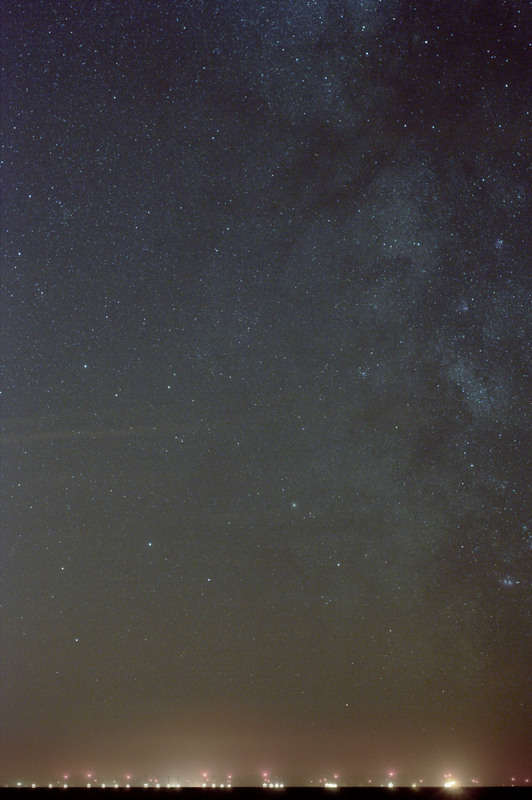 Anyway, eventually the light fades and I catch seven reasonable frames of PANSTARRS. PANSTARRS passing Mag 4.3 Yildun and its Mag 5.8 partner “24 Ursa Minor”. 200mm f/5.6, ISO 3200 7x3min. 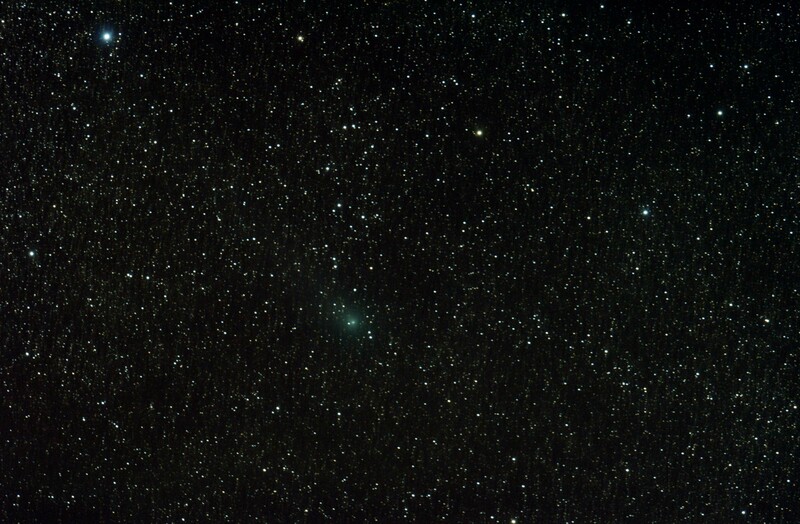 Yildun is the next star to Polaris in the tail of Ursa Minor. 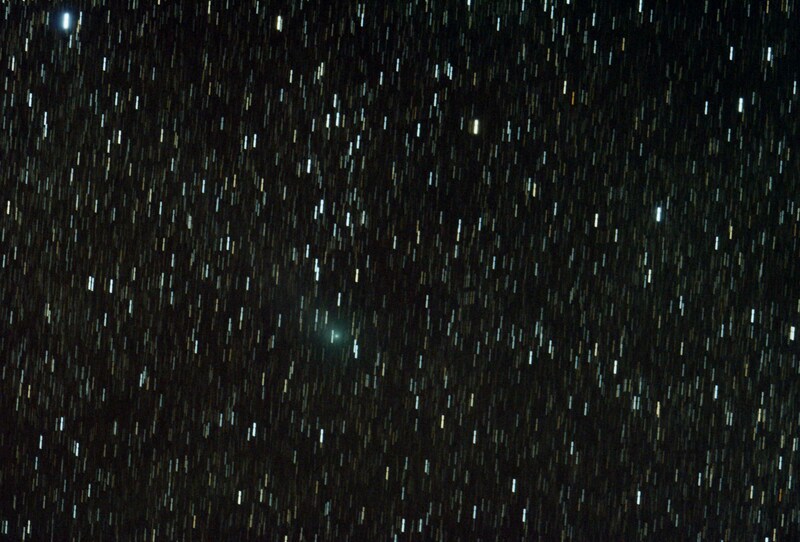 North is to the lower left of the shot, and the glow from the pesky noctilucent clouds can be seen in the comet’s tail – which is pointing pretty much towards the Sun. I shouldn’t really moan about the cloud, as the Sun is only 13 degrees below the horizon so it’s not exactly dark anyway (from an astronomical point of view). Tuesday 30th April was sunny all day, the last patches of cloud drifting away to the north in late afternoon. After my previous encounter with humidity and moonlight in Kentmere, it looked like a good opportunity to test this new dark site. This is how my setup looks. Just me, a layby and the EQ3-2 equatorial mount. At 9.30pm the Sun has already set, but I wanted to leave plenty of time in case it clouded over and I had to dash to another location. It will be another couple of hours before the Sun is 18 degrees below the horizon, the offical end of astronomical twilight. Elevation 25 degrees, Sun is 15.7 below horizon. Elevation 25 degrees, Sun is 16.2 below horizon. Elevation 25 degrees, Sun is 16.4 below horizon. These unprocessed frames with the Sun only 15 degrees below the horizon show what a difference that makes to long exposures. 50mm f/2.8, ISO 800, 8 min. 2 X 240 sec. frames stacked in Photoshop. Two frames of 4 minutes each, stacked as layers in Photoshop. 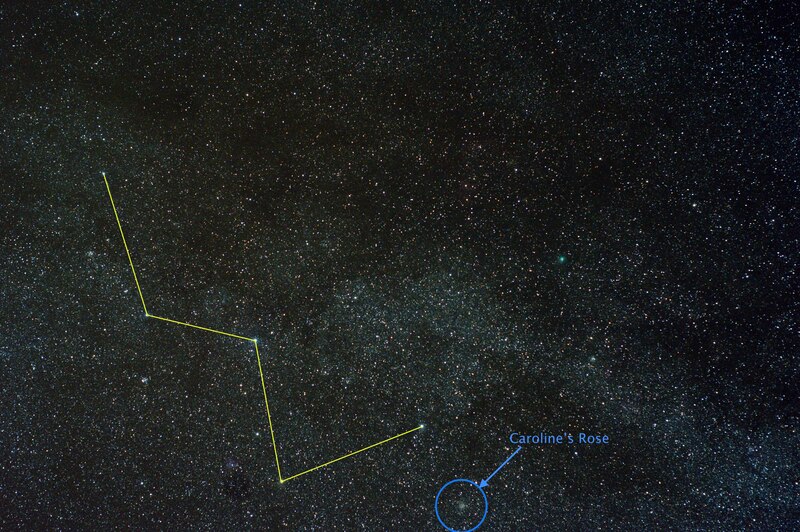 PANSTARRS is in the centre, moving from Cassiopeia to Cephus. 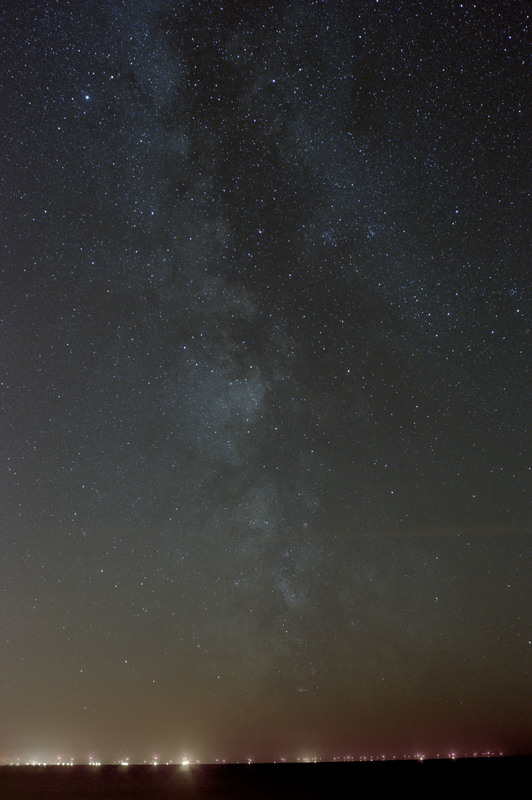 The settings of ISO 800 and 240 seconds were inspired by Fred Espinak’s version, using pretty much the same kit. I guess the difference in our results is an indication that, even on a good night in Kentmere, conditions in Arizona are better. 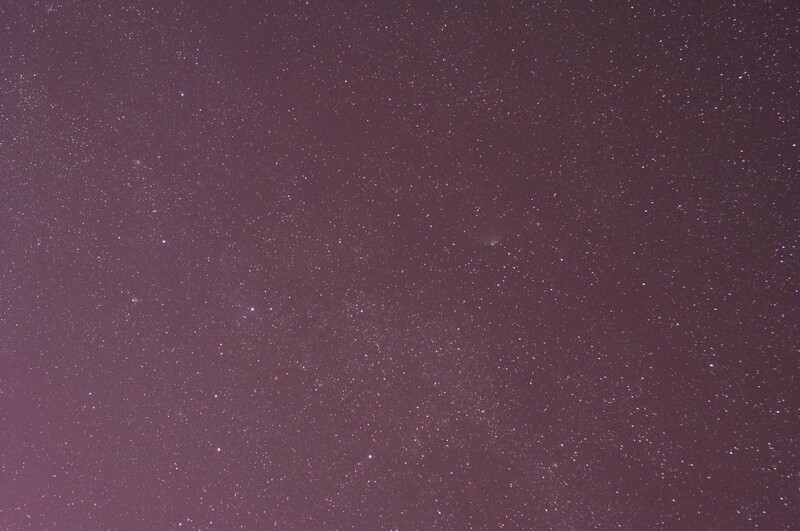 The thousands of stars in the bottom left corner (Cassiopeia is in the Milky Way) become so indistinct through our 80% humidity that they look like background glow, and any attempt to eliminate them damages the rest of the picture. On the other hand, it could just be that Fred is much better at this than I am. 300mm f/5.6, ISO 3200, 12 min. With the 300mm lens, the optimum aperture is f/5.6 so I have wound the ISO up to 3200 to compensate. 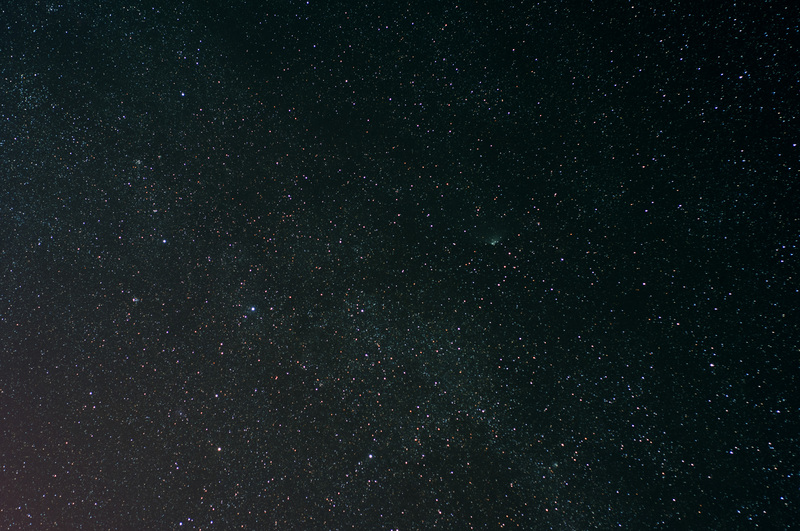 Four minutes tracking with the 300mm lens is quite satisfying, with the stars showing no sign of trail. 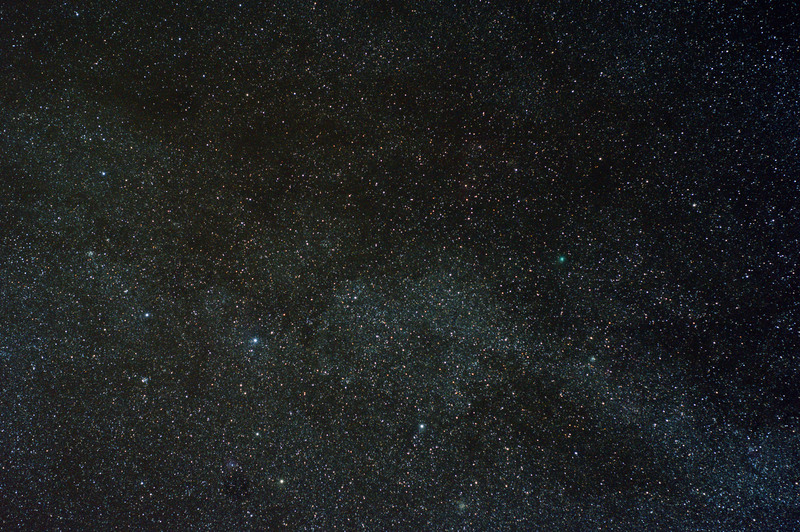 PANSTARRS is passing close to two nebulae, Cederblad 214 and NGC 7822, between Cassiopeia and Cephus. While neutralising the background, I notice that I have caught some nebulosity in Cederblad 214 – that’s the reddish glow to the right of PANSTARRS. 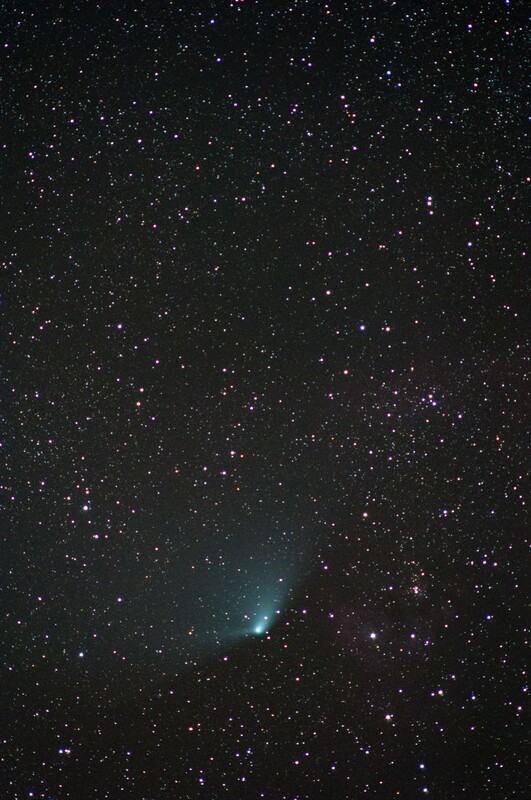 The comet itself still has two distinct tails. 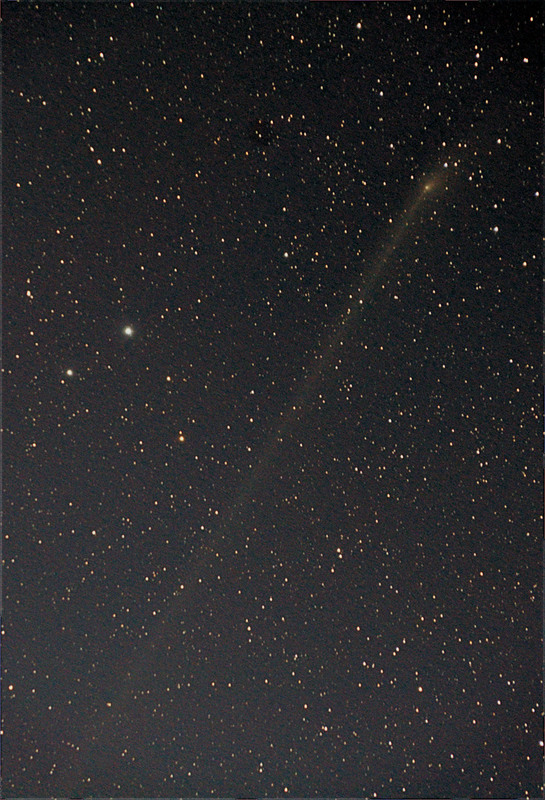 The ion tail points away from the Sun (towards one o’clock in this photo) and the dust tail trails behind the comet (towards nine o’clock in this photo). 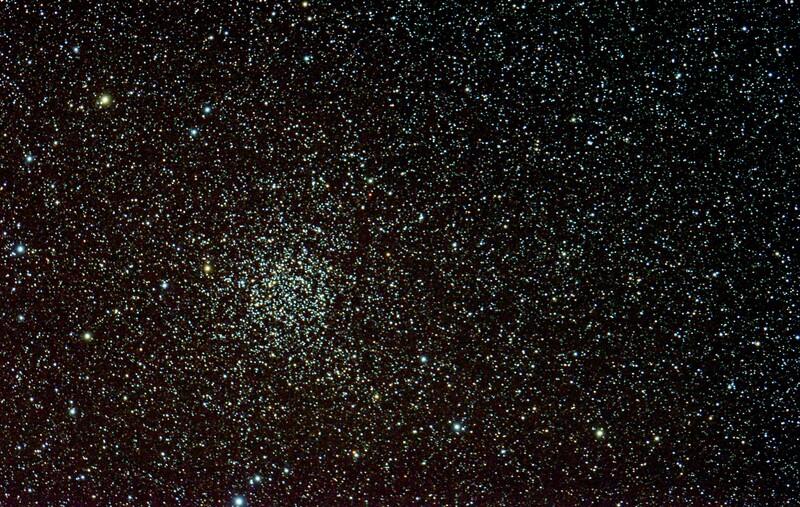 300mm f/5.6, ISO 3200, 5 min. Before packing up, I can’t resist an attempt at a five-minute frame. The tracking seems to hold up well, which promises much for future sessions.